1. 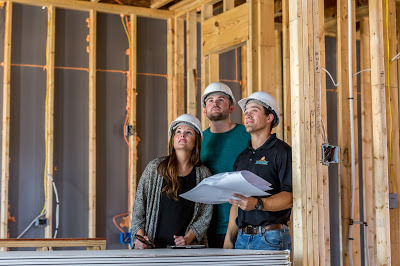 Building Lifelong Relationships Our team of builders, sales people, and architects understand that they are building more than just your home. It’s in our company DNA to not only want to build quality homes but to do life with our customers and the communities in which we build. While our homes may provide the foundation, it’s the relationships that make the difference. 2. The Style and Design You’ve Been Dreaming Of We offer a wide array of open concept floor plans with timeless features and current styles in mind. We have the dream home for you. Our plans offer something for everyone from new families to empty nesters and everyone in between. 3. Energy Efficiency We know that energy efficiency is important to you. That’s why we build our homes with the top energy standards including Low-E windows, radiant barrier, 15 seer HVAC, R44 Attic insulation, sprinkler system rain sensor and so much more. Community. Defined as a group of people living in the same place or having a particular common interest is somewhat cold and vague compared to the community that we were witness to this past weekend in Waxahachie. Fellowship, purpose, history, and love could all be used to better define the community that came out in full force to support the Samaria Baptist Church this last weekend. What an honor it was to be a part of such an amazing cause right here in Ellis County, the restoration and revitalization of the Samaria Baptist Church of Waxahachie.